Life Design Event Planning had the incredible opportunity of planning the destination wedding of the stunning Heather & Ryan last fall. I instantly connected with the happy couple and admired the love they showed for each other, and after months of wedding planning and spending time with them, my admiration for them continued to grow. They are so in love and it oozes out of their personalities for all to share. Such an amazing sweet couple. Heather, who I mentioned before, had her heels autographed by the designer himself, Mr. Christian Louboutin! How many brides can say that? 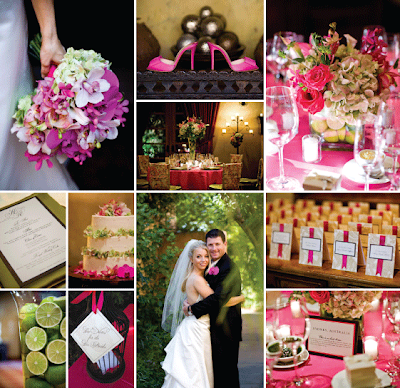 Like a fairytale, it seemed Ryan and Heather were meant for each other from their very first meeting. Before Ryan came to Heather’s workplace to give a presentation, her boss had already told her she could see the two of them together. 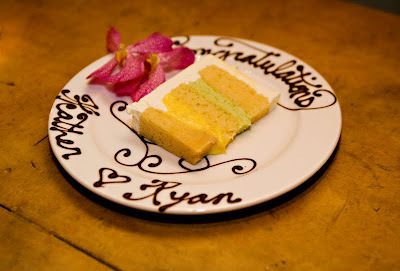 On the night he proposed, Ryan first gave Heather a three-opening picture frame with two pictures of the couple. Then he told her he needed her help filling the third. He handed her another gift—a small box from Harry Winston. Heather thought it was a pair of earrings until Ryan asked for it back and got down on one knee. The couple’s wedding at the Royal Palms also seemed meant to be as each time they visited, they were approached by people who had been married there or attended a wedding there. 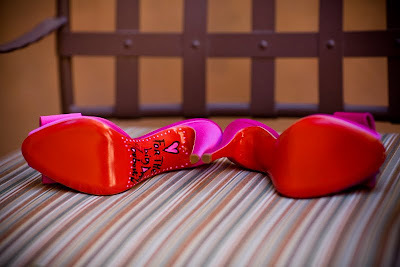 And no fairytale would be complete without a glass slipper—or in this case, hot pink Christian Louboutin heels, signed by the designer himself. 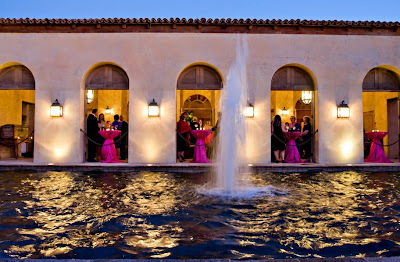 Here is a shot of the cocktail hour at the spectacular Royal Palms Resort, Phoenix. Check out the ceremony backdrop. 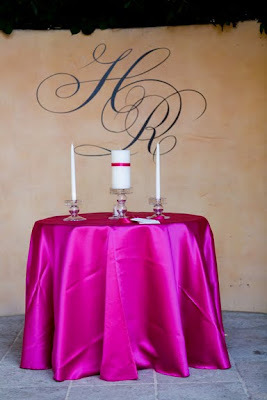 It's Heather and Ryan's initials made custom from Wedding Graffiti. It was so easy to put up and pull down without damage to the wall but certainly make sure you do a test run before hand. Originally, we were going to put in in the reception room but let's just say that didn't work out. 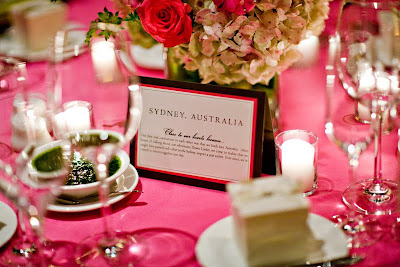 Tables were named after cities that were "close to our hearts" and they shared with their guests why those destinations were so important to them. 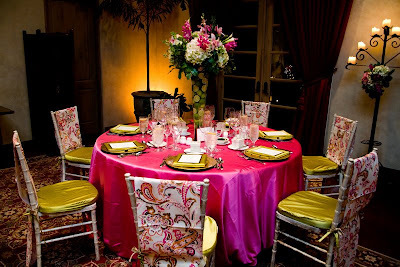 Much of the design was around these custom made paisley chair backs. 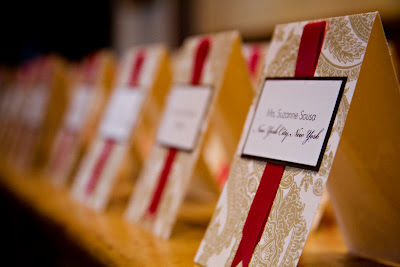 We carried the design even to the placecards that Rikki from The Invitation Lady had custom made as well. Pretty, huh? 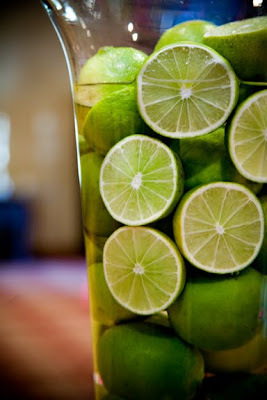 We used limes in the design too. 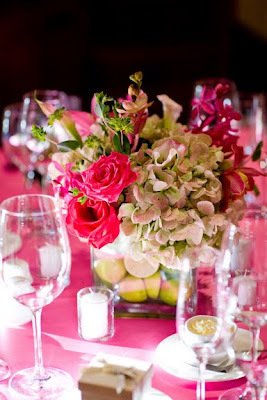 It was an cost effective way to have that pop of color with those hot pink linens. 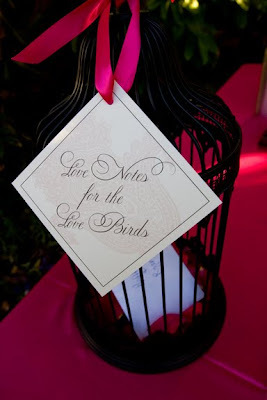 Using this birdcage it gave the guests a chance to place the envelopes for the bride & groom. Hanging on the cage was a cute tag that noted :: "love notes for the love birds". 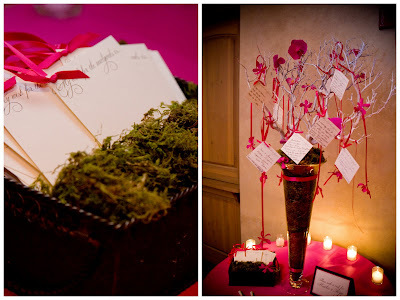 For the guestbook we opted for a "wish tree". Each guest took a tag that stated, "My wish for the newlyweds is.." and wrote their thoughts, comments and wishes to Ryan & Heather. Then guests hung them on these beautiful branches where Jeanne from White Poppy Floral draped with lush hot pink orchids and draped with ribbon. I also asked Heather to answer a few questions about her wedding day and here is what she had to share. A :: We met thru mutual friends where I worked. A :: YES! The rest is a blur! A :: The very first thing we planned for the wedding was Cicely!! A :: Ryan was 50% of the planning. I am so lucky! A :: Our favorite part of designing the wedding was making it reflect the two of us as a couple and making decisions together! 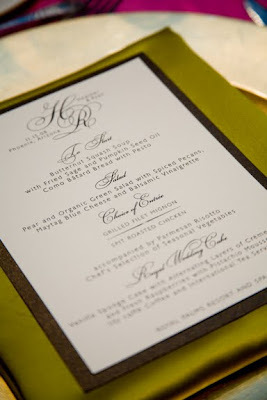 A :: Our least favorite part of organizing the wedding was trying to finalize last minute details while waiting to hear back from late responses and knowing how much we had to spend to reach the resorts minimum, but not knowing how many guests would be there was difficult. A :: Ryan really wanted the ceremony to go well. I was most anxious about having the moment where we saw one another before the ceremony to go well. A :: One?? I would tell newly engaged brides to remember the reason for the day. It is to celebrate you two as a couple, and it is your wedding. And hire a planner - at the very least, for the day of. Let them handle logistics. You enjoy your wedding!! (and when the twentieth person in one day asks if you have set a date and you got engaged last night, smile and tell them you are enjoying the newness of being engaged and look forward to planning details like that). Oh! And choose the gown you like. And it's okay if you don't cry when you find it. A lot of brides don't cry, even when they find the perfect dress. Thank you for letting us be a part of your special day and trusting me to be your wedding planner, Heather & Ryan. The Life Ladies and I wish you all the happiness in the world! You both are incrediable people and now my friends.